Sound Class 9 Notes follow CBSE guidelines to get rid of any confusion among children regarding the content of the course since CBSE keeps on updating the course every year. These notes help the students cover each and every concept given in the chapter. Sound Notes would provide you with clear understanding and retention of the course content which would help you score more marks. What do you understand by Sound? Sound is a mechanical energy which produces sensation of hearing. Sound is produced due to vibration of different objects. Sound wave propagates as compressions & rarefactions in the medium. Sound waves are longitudinal waves. Sound waves are produced due to variations in pressure & density of the medium. Compression is the portion of the medium where a temporary increase in volume & a decrease in density takes place when a sound wave passes through the medium. 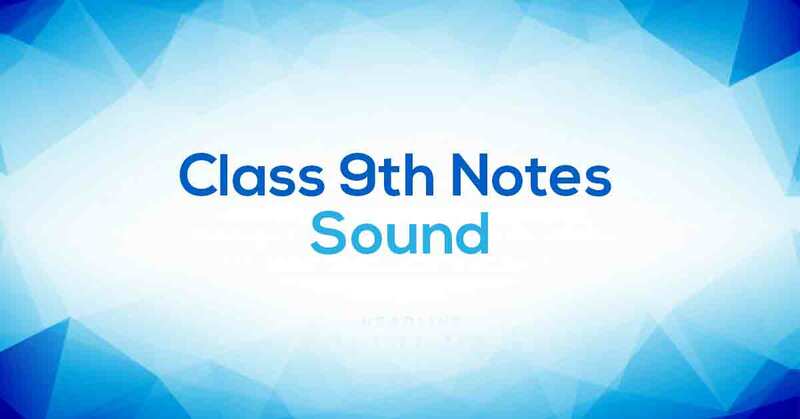 Know more about the same in Sound Class 9 Notes pdf.